I bought a Handspring Treo 600 in November 2003, to replace a three year old mobile phone. My first PDA since I stopped using a Palm 1997-1999. Sprint PCS is my carrier. I've been keeping a mobile lifestyle journal on TheFeature.com, detailing my relationship with this complex machine. In addition, I hang out in the TreoCentral.com message boards; you can see my previous posts here. 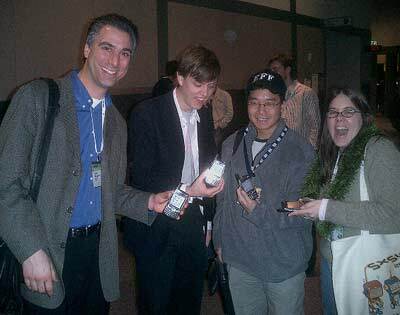 There is some camraderie for this device; four Treo 600 owners gathered at SXSW. I draw pictures and write poems with the device, and post them on mobile.links.net. It's a rather nice contemplative activity on a device intended for active productivity. Occasionally I use the device's camera - you can see some sample shots: T6 gallery. mo:Blog allows me to take notes or write poems, and publish them live to this web site from my Treo 600. Bascially, mo:Blog interfaces with Movable Type or Blogger, weblog publishing softwares, so you can scribe on the run. Witness: mobile notes and moku. For some background on the difference between a weblog and a moblog, try this article I wrote for TheFeature.com: From Weblog to Moblog. I have an IMAP email server; I use Snappermail to check my email on the Treo 600. It took me about eleven months after I got my Treo to be able to easily read email on it, because of the IMAP connection. What a difference! 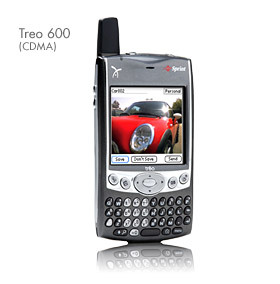 When I was using a PC Laptop, I used my Treo 600 as a wireless modem to connect to the internet anywhere I got mobile phone signal. Attached to my Thinkpad via USB, with Sprint PCS, it's faster than a regular modem. I don't pay for WiFi in airports or hotels anymore. Primary drawback? Can't talk and modem at the same time. Ahh well. I can modem from anywhere! And I have - highway reststops, rural islands off the coast of Georgia, planes sitting delayed on runways. It's awesome. Fun drawing and painting program for the Palm OS. I use the program to draw things like this: I've taken some notes on color correction with Photoshop and Handpainter. Play MP3s on the Treo. And if you register this app, you can play Shoutcast streams - live radio coming in through your device. My favorite use of this is to run NPR news through my Treo as I drive highway 5 between Los Angeles and San Francisco. Here's a list of some Shoutcast feeds I run on my Treo 600. You can load that previous link there into your Treo's web browser and then each of the links to Shoutcast streams should open in PocketTunes. BART, the commuter trains for the San Francisco Bay Area, has their own custom-made schedule and map software for the Palm OS (and Pocket PC). Brilliant! Why doesn't the New York MTA have this, for example? File books you own and books you don't own. Auto-download updated RSS feeds - instant news and weblog updates. It's a great idea. But I don't use it. I'm not sure why. Maybe I'd rather read weblogs on the big screen. Otherwise, I'm all about communicating; using mo:Blog and SMSing with friends. And probably the best link I found for the Treo 600 "Blazer" web browser was this page: PDAPortal.us, a listing of mobile-tailored web sites. When I'm at my computer, I read TreoCentral to keep up with Treo-related news and software development. PDAPortal lead me to the BBC mobile, which has fantastic updated ad-free world news stories. Also, let me suggest that Japanese Railway melodies might make good ringtones.